Pakistan 122-6 (Shahid Afridi 52*, Shoaib Malik 27, Nuwan Kulasekara 2-13) beat Sri Lanka 99 all out (Chamara Kapugedara 19, Lahiru Thirimanne 18, Mohammad Sami 3-16) by 23 runs. Peculiar feature of the match – Shahid Afridi became the first player to participate in the 50th T20 and he is the only player who has scored 801 runs with 58 wickets in his pocket. Pakistan scored 122 runs for the loss of six wickets in 20 overs and the innings of Sri Lanka was folded back on 99 runs in 19.2 overs. Shahid Afridi was declared ‘Player of the match’ for his excellent all round performance as he smashed unbeaten 52 runs off 33 balls, grabbed two wickets and held an excellent catch. The second and final Twenty20 was played at Mahinda Rajapaksa International Cricket Stadium, Sooriyawewa, Hambantota on Sunday, June 3, 2012 and a packed house enjoyed the thrilling match. Earlier, Sri Lanka rested Mahela Jayawardene and Angelo Mathews came out for the toss with Mohammad Hafeez. The latter won the toss, elected to bat and opened the innings with Ahmed Shehzad. The first two overs produced 11 runs and then the disaster began for the visitors as they lost a couple of wickets for just 18 runs in five overs. Umar Akmal was promoted up in the order but he once again failed and became the third victim after the addition of 11 runs to the total at his personal score of five runs. The experienced Shoaib Malik came in next as Hafeez was dropped on the fourth ball of the 10th over by Thisara Perera off Isuru Udana at 19 runs. The first 10 overs produced 40 mere runs as Hafeez put Pakistan in trouble by losing his wicket on the first ball of the next over for 24 off 34 balls with 3 fours. Shahid Afridi came in the centre, joined with Shoaib Malik and they started the repair work while putting their heads down. Afridi was the most attacking of the two and picked up boundaries at regular intervals and Malik joined with him in the 15th over by dispatching three consecutive fours. 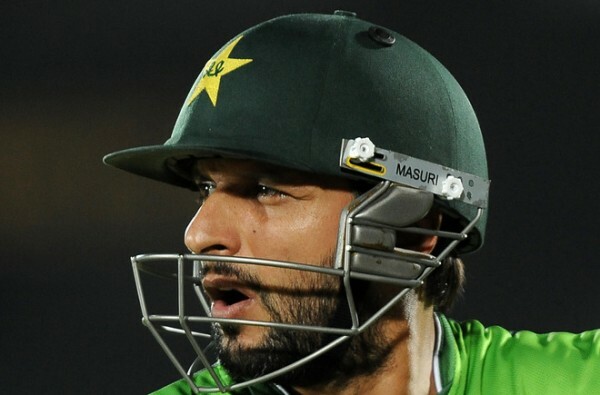 The fifty of the partnership was accumulated in the 17th over and Afridi added a couple of fours to that over as well. The score was enhanced to 109 in 18.3 overs when Shoaib Malik was caught by Tillakaratne Dilshan off Perera for 27 off 27 deliveries with 3 fours. Shahid Afridi achieved his fifty in the final over, remained unbeaten for 52 off just 33 balls with 1 six and 5 fours as the Green Shirts managed 122 runs with four wickets in hand. Nuwan Kulasekara and Kaushal Lokuarachchi were the main wicket takers with two each whereas Thisara Perera held one. Sri Lanka initiated their innings with their most seasoned pair of Kumar Sangakkara and Tillakaratne Dilshan. They started off in a positive manner by scoring 17 runs in the first two overs with 3 fours but Sangakkara was caught by Shoaib Malik off Yasir Arafat for 8 in the fourth over. Arafat removed Nuwan Kulasekara on the last ball of the same over and the Islanders were reeling at 19-2 at the end of the fourth over. Chamara Kapugedara took guards in the centre as Dilshan was going strong at the other end while adding handy runs. Hafeez introduced Afridi in the eighth over and both batsmen survived a couple of huge appeals but the bowler struck back when he clean bowled Dilshan for 18 off 21 balls with 4 fours. The young gun of the Lankan Lions, Dinesh Chandimal was the next batsman who joined in with Kapugedara and they started their journey towards the target by adding useful runs. Kapugadera opened his arms with a four in the 11th over and hit a six on the second ball of the following over bowled by Shahid Afridi. He was clean bowled on the third ball of the 12th over for 19 off 23 deliveries with one six and two fours. Chandimal was clean bowled by Sohail Tanvir for 12 and Sri Lanka was in trouble at 76-5 in 14.5 overs. The Pakistani bowlers took over from there and made life difficult for the home side with their lethal bowling. Mohammad Sami changed the complexion of the game by removing Lahiru Thirimanne and Perera in the 17th over and the whole Sri Lankan team was bowled out for 99 runs with four balls to spare. Mohammad Sami and Yasir Arafat were the star performers with three wickets, Shahid Afridi picked up two wickets whereas Sohail Tanvir and Saeed Ajmal shared one wicket each. Pakistan won the sensational match by 23 runs and levelled the two match series at 1-1.